rats | Park View, D.C. Rats are a huge issue, and one that seems to be growing in the District. 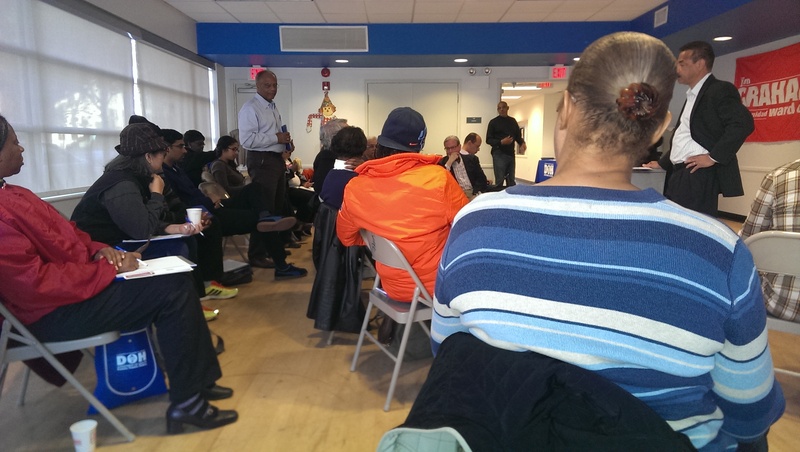 Back in November 2013, Councilmember Jim Graham hosted a Ward 1 Rat Summit as part of an education and outreach effort to help reduce our rat populations, and since that time the problem has only gotten worse. Understanding how important this problem is — not only as a nuisance but as a basic public health concern — I was happy to see Mayor Bowser address the issue last week. Below is the news release outlining her efforts to deal with rats. (WASHINGTON, DC) – Today, as part of Back to Basics DC, Mayor Bowser highlighted three District projects aimed at decreasing the rodent population in Washington, DC. The Mayor was joined at the announcement by the Director of the Department of Health Dr. LaQuandra Nesbitt, Chief Technology Officer Archana Vemulapalli, representatives from the Department of Public Works, and community members. Because most rodent activity stems from inappropriately stored garbage, the District’s rat abatement projects focus on improving how the city, businesses, and residents manage trash. The efforts bring together resources from the Department of Health (DOH), the Department of Public Works (DPW), the Office of Unified Communications (OUC), the Office of the Chief Technology Officer (OCTO), and the Department of Small and Local Business Development (DSLBD). Earlier this month, DSLBD launched the Commercial Waste Compactor Grant, which offers up to $13,500 for qualified DC businesses to purchase or lease a commercial compactor for their trash, recyclables, or compost. The grant program runs through September and could help over 60 businesses reduce rodent activity by using sealed, rodent-proof compactors. More information about the grant program is available at dslbd.dc.gov/compactor. In addition, DOH is working closely with DPW and OCTO to strategically deploy 25 solar trash cans and 400 smart litter bins in rat hotspots around DC. The solar trash cans, which are enclosed and rat proof, have solar panels built into them, allowing them to compact trash without being connected to the electrical grid. 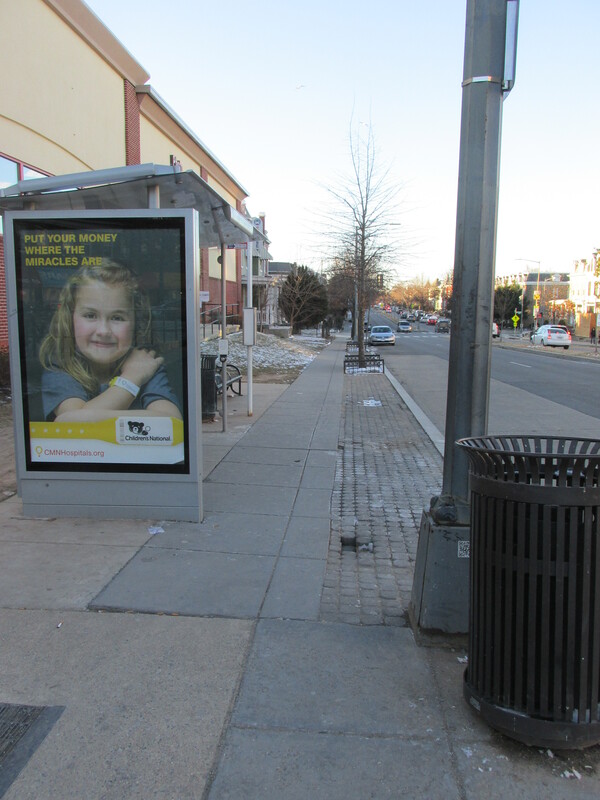 Solar trash cans have already been installed on Barrack’s Row, Freedom Plaza, and Indiana Avenue, NW. The smart litter bins are trash cans equipped with a sensor that monitors in real time the amount of waste in a bin, the weight of the waste, and whether someone suddenly added large amounts of waste. The sensors then relay this data to a cloud-based web service used by DPW. The web service compiles the data into a map of every sensor-equipped bin in the city, showing which bins are ready for pickup. The data collected will enable DPW to better mobilize crews for pick-up and improve route and bin deployment efficiency. DC’s rodent population is believed to have risen in recent years as a result of warmer winters. Last year, the number of 311 requests for rodent abatement increased by 65 percent from 2,300 in 2015 to more than 3,500 in 2016. The District takes a comprehensive approach to rodent control that includes community outreach, surveys, abatement, enforcement and cooperation with other DC agencies. he city deploys teams of rodent control experts who target pests on public property, and will also treat private property if residents obtain signed petitions. report rodent issues in your neighborhood, by calling or texting 311. If you hat rats and would like to know more about why we have them in cities, you will likely be interested in the June 10th Rat Riddance Rodent Academy that is scheduled for Duques Hall (see flyer below for details). This sounds a lot like the Ward 1 Rat Summit that then Councilmember Graham held back in November 2013. Like the event scheduled for June 10th, the featured speaker was Dr. Robert Corrigan who is very knowledgeable on rats, their behavior, and what they need to thrive. Dr. Corrigan is an excellent speaker and worth hearing if you’ve never participated in one of his programs before. The sidewalk by CVS on New Hampshire Avenue. 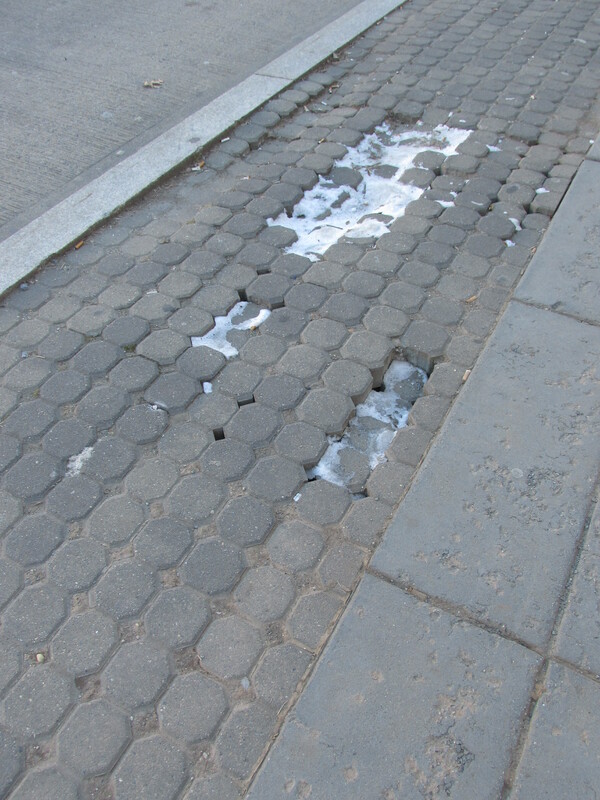 For a while I’ve noticed that the pavers along New Hampshire Avenue by the Georgia Avenue CVS were sinking … and then last week it hit me why. Rats! As I walked down the sidewalk I saw what appeared to be holes for rat burrows along the edge of the sidewalk and I suspected that it was these burrows that were causing the pavers to sink. I contacted the Rodent and Vector Control Division of the DC Department of Health (DOH) and asked for an inspection, and sure enough, rats. According to the report I got back from their inspection the rat problem is very bad at the sidewalk area by the CVS. 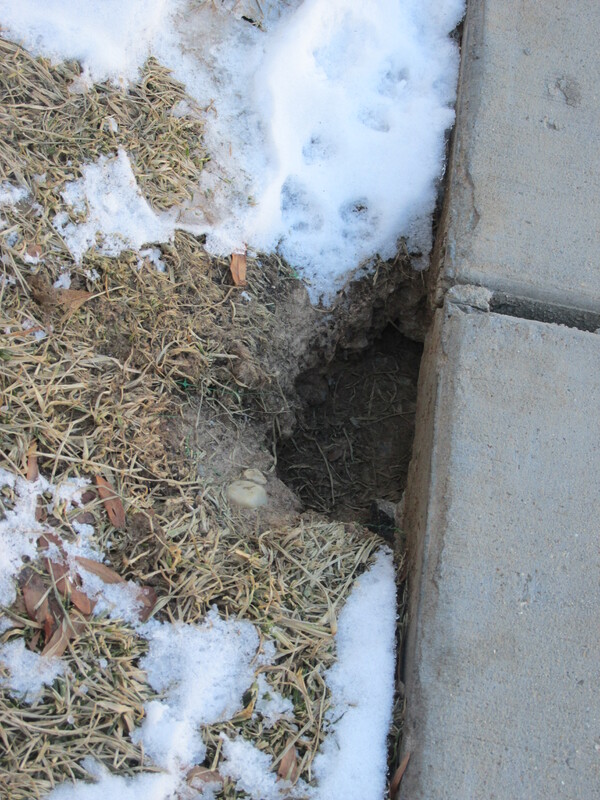 The DOH pest controllers observed and treated 12 rat burrows on the New Hampshire Avenue side close to the bus stop. Due to the severity of the problem the location is now on a weekly baiting schedule until the problem is under control. While this probably won’t be much of a surprise to anyone, I’ve been somewhat focused on rats this year (and am sure that I will be on and off for as long as I live in Washington). As a follow-up to the Ward 1 Rat Summit held in November, I’ve been reading up on rats, what makes them thrive, and what residents can do to reduce their numbers in our communities. 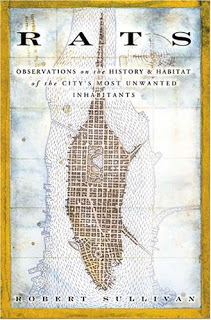 As part of this adventure, I’ve come across a book titled Rats: Observations on the History and Habitat of the City’s Most Unwanted Inhabitants written by Robert Sullivan and published in 2004. I haven’t finished it yet, but I’m finding it to be a great read. Not only is it very informative about rats and rat behavior, it’s also a very readable work that’s as much a history about New York City as it is about rats. If you haven’t checked out this book before and you enjoy both reading and learning about urban environments, this could be a good winter read for you. Typical trash and recycling cans found in Ward 1. 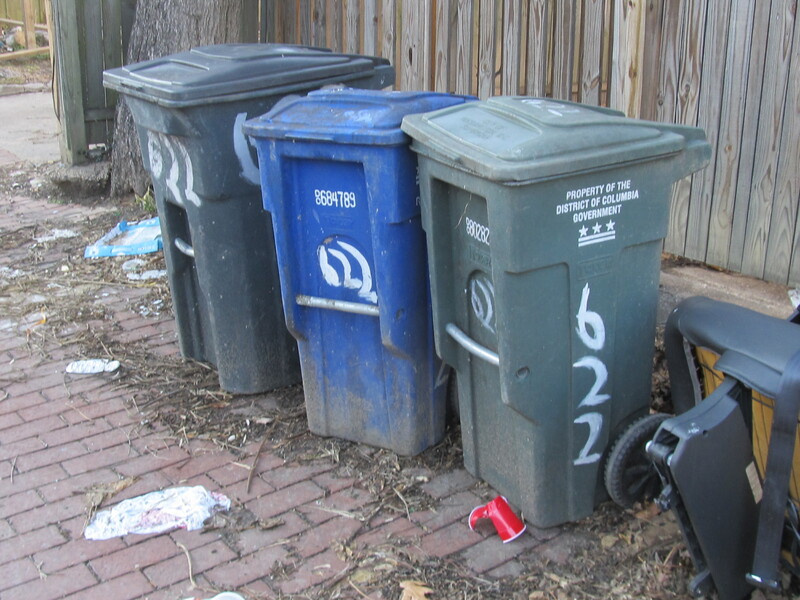 Over the weekend, the Washington Post reported that Mayor Gray’s plan to replace the trash and recycling cans in 2014 is in trouble. The problem, it seems, is that the D.C. Council objects to the money-shifting strategy Gray has proposed to pay for the program that would impact about 75,000 District households. To pay for this, Gray proposed to draw from funds previously budgeted for the District’s retiree health-care fund, and this is something that concerns council Chairman Phil Mendelson. The garbage-can plan transfer involves $9 million. I certainly hope the council and mayor can find a solution for funding new trash cans. Currently, resident are required to pay a fee for replacement cans. The fee is $62.50 for a Supercan or $45 for a 32-gallon trash can or recycling can. Senior citizens, age 60 and older, are able to pay $30 for a Supercan, or $20 for the 32-gallon trash cans and $20 for the blue recycling cans that are used citywide. For trash cans that can be repaired, the Department of Public Works will replace for free broken and/or missing wheels, tops and lift bars for 96-gallon Supercans. While well maintained trash cans may not strike some as an important issue, in the fight to keep alleys clean and rodent free, they are essential. Improperly disposed of trash supplies food to rats and other wild animals which, in turn, contribute to greater health risks to the community. Dr. Robert Corrigan speaking during the Ward 1 rat summit. On Saturday, November 9th, the District Department of Health, along with Councilmember Jim Graham, Department of Public Works Director William Howland, and Department of Consumer and Regulatory Affairs Director Nicholas Majett, hosted a rat summit at the Columbia Heights Recreation Center at 1480 Girard Street, NW. The summit began at 10 a.m. and wrapped up shortly after noon. It was an excellent opportunity for residents to learn more about reducing rat populations, current trends, and ask District officials about specific problem areas. 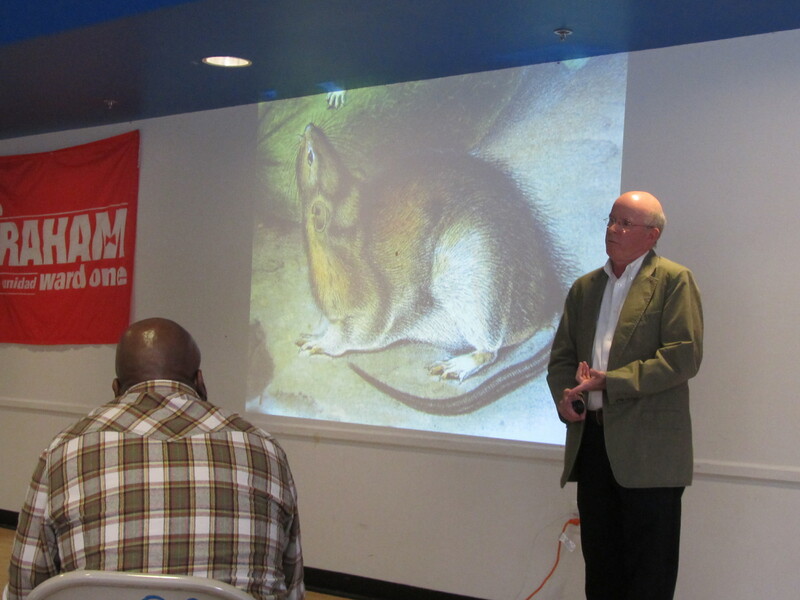 The featured speaker was Dr. Robert Corrigan, a noted authority on rodent control, especially knowledgeable on rats. His presentation was both informative and interesting. Corrigan was especially helpful as he presented factual information based on years of research and scientific data. 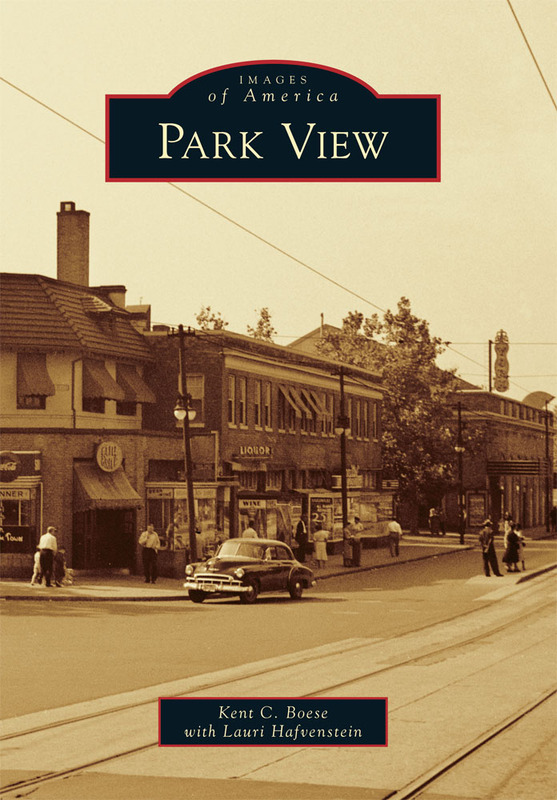 One item that I found to be of particular interest for residents in the Park View area was the relationship between feral cats and rat populations. It was clearly presented that the belief that having cats in the community will help control rodents is a myth! It is a scientific fact – proven at least 20 years ago – that feral cat colonies do not reduce rat populations. Few cats will challenge a rat. Although some cats hunt for mice, many cats tolerate rats or mice, especially when they are well-fed. It could be said that more rats and mice have been fed by cat food than killed by a cat. Director Howland was particularly emphatic that it is illegal to leave cat food out in an uncontrolled manner – including in public alleys. Rat’s incisors (the front teeth) are hard — harder than iron, platinum and copper. Measured on the Mohs hardness scale, the rat’s lower incisors rank 5.5 (diamond is a 10). Human enemel is not quite this hard, measuring 5 on the Mohs hardness scale. This is why a rat can, and will, gnaw through trash cans and water pipes to get to food when they smell is. Leading up to Dr. Corrigan’s presentation, Director Howland informed the assembly that by June of 2014 all of our trash and recycling cans will be replaced on a city-wide basis. Currently, the city will repair broken trash can lids and wheels for free (call 311), but damaged trash can bodies are only replaced with payment of a $45 replacement fee. It is good news that all containers will be replaced within the year. Councilmember Graham specifically asked about construction and how it related to disturbing rat populations. Director Majett, during his presentation, shared that only raze permits alert the Department of Health to inspect a property, and bait it, prior to building activity. Thus, other construction activities will disturb rat populations and cause them to seek other locations. However, Corrigan noted that this disturbance of rat population only occurs with properties that already have an infestation problem. Thus, returning the discussion to the absolute necessity of having good sanitation. Lastly, clean alleys and neighborhoods that practice good sanitation will stress a rat population by reducing the amount of food available. When rats are stressed, they live shorter lives and have been known to attack each other. By residents, businesses, and the city all doing their part, they can go a long way in decreasing the number of rats in the District. Answering community questions during Director Howland’s presentation. Rats! Everyone hates them and our neighborhoods continue to work with the city to reduce the population. Last year’s warm winter made the population soar this summer. It has also been my experience that a big part of the problem is human behavior as we improperly dispose of trash and debris. 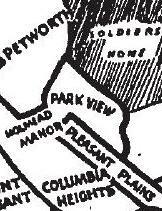 If you’d like to know more about rats and how to get rid of them, consider attending the Ward 1 Rat Summit this Saturday, November 9, 2013 at 10:00 A.M. at the Columbia Heights Community Center, 1480 Girard Street N.W. The full announcement is below (printable version here). The D.C. Department of Health (DOH) is sponsoring a one day Rat Summit in each of the city’s eight (8) wards starting Saturday, November 9, 2013, in Ward One. Business owners, residents, neighborhood associations and community leaders are all welcomed to attend. What prompted the Rat Summits? DOH has received a number of citizens’ complaints about the increased rat presence throughout the city. In an attempt to abate the rat population, the Department would like to provide information and education to community groups, residents, and business owners on topics such as proper waste storage, rodent proofing, and their ability to assist with rodent abatement. DOH has a number of featured guests and speakers lined up for the Summits. Councilmember Jim Graham, Ward One representative; Mr. Robert Corrigan, PhD. author of Rodent Control, A Practical Guide For Pest Management Professionals. Mr. Corrigan has authored more than seventy technical publications on pest control and the principal the “Development of IPM Rodent Plan.” Featured presenters ar Dr. Joxel Garcia, Director e Mr. William Howland, Director, the Department of Public Works; Mr. Nicholas Majett, Director, the Department of Consumer and Regulatory Affairs. The Directors will discuss their agencies role in reducing rats in the District. The first Rat Summit will be held Saturday, November 9, 2013 at 10:00 A.M. at the Columbia Heights Community Center, 1480 Girard Street N.W.